2013/09/12 plagwitz	Enter your password to view comments. 2. Or in the running text, colored in red (and with no entirely obvious English translation for me who I do not speak Russian, but likely for you). The target file is here (in most browsers other than Internet Explorer 64-bit, you should be able to open this in EXCEL for easier editing). We need Russian and English in 2 columns. 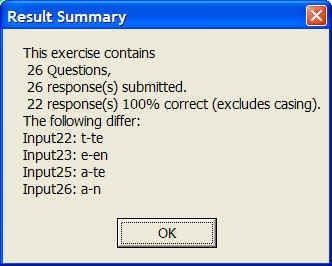 The computer program we are going to feed these flash cards into is quite simple in its automatic evaluation. That’s why we need to enable students to guess exactly the Russian from the English flash card side (and vice versa). Hence we may need to simplify the entries in both. 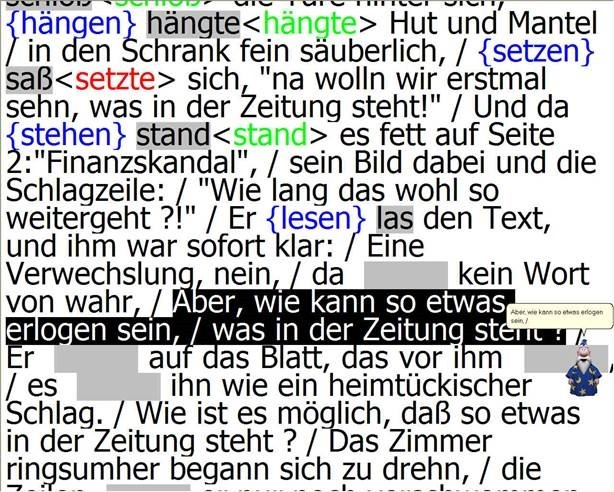 – linguistic metadata (like gender “fem.”– but maybe not articles: “la maison – das Haus” -, irregular verb) in a separate column, per language. В чём де́ло? – idiom: What’s the matter? что ещё на́до? – what else (does one) need? Hint: the easiest way to get the vocabulary charts Russian – English from Word into 2 columns in Excel: CTRL+H, “find:” space-space, “Replace”:^t (for tab), then copy/pasting the result makes 2 columns for Russian/English. The usefulness of the Sanako Study 1200 new (from ver 6) vocabulary test activity hinges on the availability of site-specific vocabulary lists. seems aware of this and publishes vocabulary collections for textbooks and assessments commonly used in UK secondary education. Sanako favors using the built-in format and saving it on the network share that is required for the Sanako study 1200. Vocabulary tests are organized and can be discovered and browsed by file name only. establish which textbooks are (and will remain) in use? are they e-books or would the material need digitization? how best to reformat the materials (from turning into a table to handling linguistic metadata) for easy use with the Sanako vocabulary test? how best to publish the material? to make it manageable for the updaters: crowdsourcing? copyright issuew? to make it easily selectable for the teacher: filter by integrated linguistic and course metadata? Last not least: How to do all this economically? Taking into consideration teacher preference, enrollment, preexisting materials…? benefit is lowered if online flash card applications already exist. 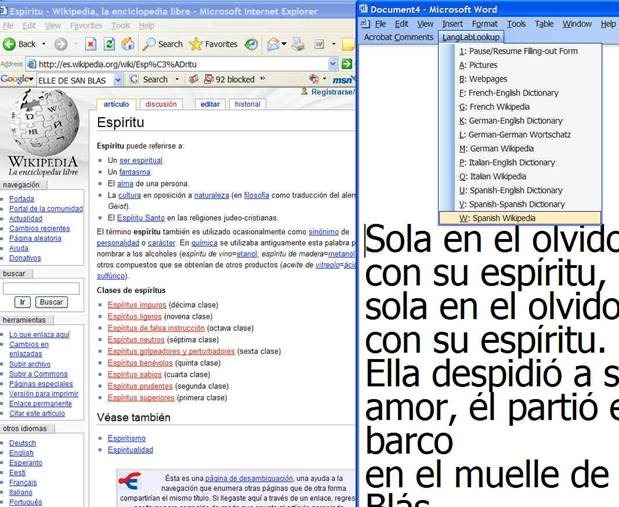 To facilitate lesson delivery and student interaction in our language lab and computerized classrooms, I am programming two MS-Office templates with interactive lookup and quiz functions and create new/convert traditional language teaching materials in French, German and Spanish with them. These templates support the learner by strengthening learner autonomy and providing immediate corrective feedback and – in conjunction with the grouping facilities of the centre’s infrastructure – allow for custom-tailored instruction based on the immediately available outcome of formative assessments. The student can be given additional hints when tabbing into a form entry field. The student can easily look up words and terms in internet-based reference works and collections. 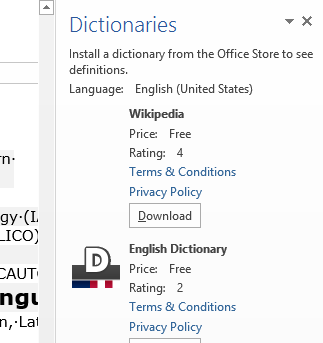 Double clicking on a word opens a browser window with the corresponding entry in a dictionary of the corresponding foreign language. Selecting a word or phrase and clicking on a menu item in the lookup menu a browser window with the corresponding entry of various reference works and databases (Figure 3: Look up Internet Reference Works, Figure 4: Look up Internet Illustrations). The student will receive instant feedback when tabbing out of an entry field. During quiz-taking, the screen will be formatted (font face, size, spacing, colors) so that the teacher keeps easily informed, whether through a computer lab management system / screen monitoring tool or by a more “pedestrian” approach for student monitoring. After collection and before correction by the teacher and reviewing by the student, the screen will be re-formatted to facilitate reading outside of the classroom setting. Information-gap dialogues (Figure 7: Information Gap Dialogues (Language Lab Example). Instructors have requested fuzzy matching for fill-in-the-blank exercises, which I am planning to implement by integrating an existing COM add-in that can make available the Levenshtein Distance Metric to MS-Word. Upgrade of Templates from Sanako Lab300 to better integrate with the new Sanako Study1200 software features. Currently implementing additional lookup options (NLP and Corpus Linguistics (ACORN, BNC, Sketchup), Dictionaries (Visurwords, Wiktionary, Google Define). Revealing correct answers after the segment. 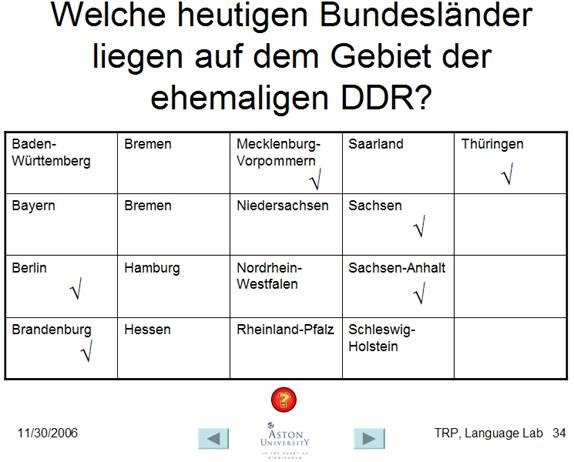 A number of templated interactive exercises can be used for revealing correct answers (word lists) depending on students’ responses. The templates support typical activities in the digital language lab (interactive presentations with multimedia, listening comprehensions, speaking and dialoguing activities for language learning, view usage examples in my Templates Eurocall Presentation video of September 2007). Teachers can use them as exercise-generating engines: they allow copy/paste of their own exercises into these templates. These templates have the advantage of being able to hook into the rich infrastructure that MS-Office provides for language teaching; they work with all Western Languages (but have been thoroughly tested only with ESL, French, German, Italian and Spanish so far). These templates that are better geared than VLE and other CALL resources for daily use in a computerized classroom environment: easy to author, take and monitor and either multimedia-heavy or focused on human interaction. 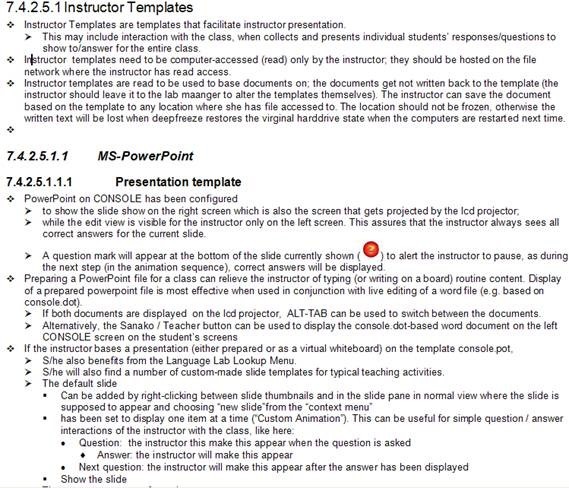 These templates support the instructor by relieving of routine tasks in favor of well-informed, well-focused non-routine intervention, and extend the centre’s screen-sharing and VOIP infrastructure to provide the instructor with an unprecedented control of the learning of an entire class. Follow the links, talk to me if you want to know more and/or post questions/comments below. I visited a number of more generic classroom management systems (NETSUPPORT, Synchroneyes). These have limited audio (no recording) support, but provide all the essentials for computer use in class at a much lower cost. Could be a temporary solution, if we add some customizing through in-house programming.